Bromsgrove’s Primrose Hospice is hoping to raise both funds and awareness by entering its first-ever show garden at the RHS Malvern Spring Festival in May. The “Time is a Healer” garden, by award-winning designer Martyn Wilson, will showcase the bereavement support that Primrose Hospice provides to children when they lose a parent or other family member. Areas of the garden have been created to represent the various feelings and moods commonly experienced after bereavement. Dark planting represents shock, denial or depression, bright colours represent anger and fear, a reflection pool offers somewhere serene to think and reflect and a calm palate of plants represents acceptance and understanding. The central sculpture (reminiscent of a clock face to symbolise the passing of time) and benches crafted by local artists offer opportunities for quiet thought or contemplation. The children’s bereavement service at Primrose was set up three years ago thanks to a start-up grant from Macmillan, but this grant is now coming to a close and the hospice has to raise around £50,000 per year to ensure the service continues. Helen Briscoe, chief executive of Primrose Hospice, says: “Our children’s work is an integral part of the support we offer. “Talking to the many families who have received help from us I am touched by the positive and lasting impact that the work of our staff and volunteers has on their lives. “Last year we supported more than 90 children affected by the death of a loved one. Many people do not realise that a hospice does much more than care for people at the end of their life. Martyn Wilson studied Professional Garden Design at the Cotswold Gardening School. 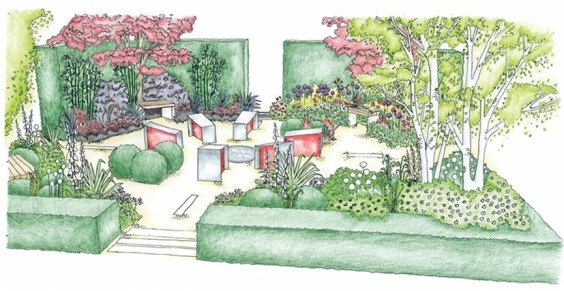 He has previously designed two RHS award-winning show gardens, one of which was featured on Gardeners World last year. The garden has been made possible by the generous support of a number of sponsors. For more information about Primrose Hospice or to make a donation please visit http://www.primrosehospice.org or telephone 01527 871051. Above: An artist’s impression of the garden. 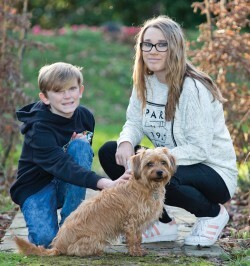 Sister and brother Lucy, 13, and Henry, 10, will feature on the planting plan leaflet handed out at the show. When their father died, the support they received from the specially-trained children and family support service at Primrose Hospice helped them cope at a really difficult time. Their mother, Francesca, says: “As a family we are so grateful for the ongoing support we receive from the amazing Family Support Team at Primrose. “Lucy and Henry have come on leaps and bounds following their creative memory sessions where they can talk openly and honestly about coping with life without Dad.